View of “Poems to Gadgets,” 2018. A group of six brass sculptures at the far end of the room is visible as one enters the gallery. These Poems to Gadgets (icicles) (all works 2018) have been molded after dripping blocks of ice and are buttressed by slim, slightly bent steel rods, lending them an air of precarious elegance. The artist was interested in solidifying an imprint of a material that begins to dematerialize upon touch. To approach the icicles, one has to walk over Poems to Gadgets (scatter piece), a surface covered with mixed sand imprinted with the tracks of previous visitors. 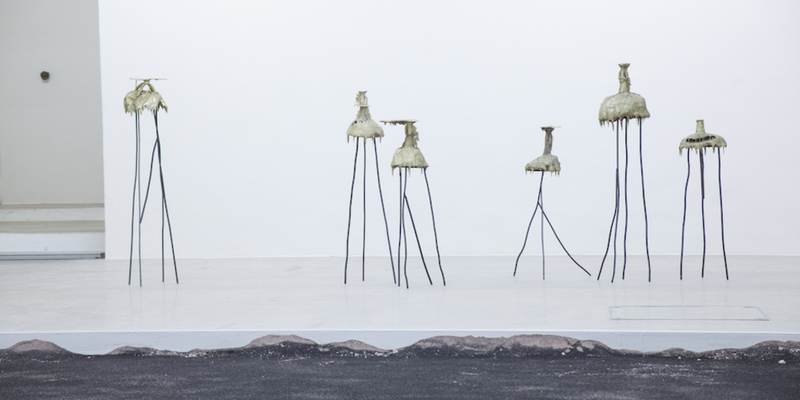 The piece consists of remnants of the sculptural production process: brown casting sand; pink fire clay used to mold the ice; and black sandblasting sand with which the sculptures were cleaned after they came out of the oven. Though ostensibly on self-explanatory display, the scatter piece remains secretive, discrete. The poetry of Loderer's work is enhanced by the ambiguous forms of the icicles—one looks like a shelter, another like a ball gown—and by the conspicuous absence of the matter of origin: frozen water. The artist doesn’t paint or polish the brass sculptures after firing them, preserving the honest materiality of her objects. The two main pieces, together with additional smaller sculptures such as Bug and Snowball, act as a fulcrum upon which a practical, earthbound mentality acts with a light touch that lifts the spirit.